For the California wine region, see Clear Lake AVA. For the city, see Clearlake, California. Clear Lake is a natural freshwater lake in Lake County in the U.S. state of California, north of Napa County and San Francisco. It is the largest natural freshwater lake wholly within the state, with 68 square miles (180 km2) of surface area. At 480,000 years, it is the oldest lake in North America. It is the latest lake to occupy a site with a history of lakes stretching back at least 2,500,000 years. Known as the "Bass Capital of the West," Clear Lake supports large populations of bass, crappie, bluegill, carp and catfish. Two-thirds of the fish caught in Clear Lake are largemouth bass, with a record of 17.52 pounds (7.95 kg). Clear Lake was most recently ranked by Bassmaster Magazine in 2016 as the #3 best bass lake in the United States and the #1 best bass lake on the West Coast. In addition to fish, there is abundant wildlife within the Clear Lake basin. There are year-round populations of ducks, pelicans, grebes, blue herons, egrets, osprey, and bald eagles, and the basin supports sizable populations of deer, bear, mountain lion, raccoon and other animals. 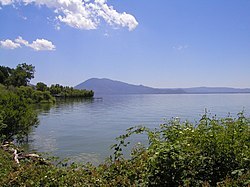 The expansive, warm water of Clear Lake makes it popular for watersports, such as swimming, water skiing, wakeboarding, sailing, boat races, and jet skiing. The California Office of Environmental Health Hazard Assessment has issued a safe advisory for any fish caught in Clear Lake due to elevated levels of mercury. Clear Lake is 19 mi (31 km) by 8 mi (13 km) at its widest point, with a surface area of 43,785 acres (17,719 ha) and a 1,155,000 acre⋅ft (1,425,000 dam3) capacity. Average depth is 27 ft (8.2 m), maximum is 60 ft (18 m), lake elevation is 1,329 ft (405 m), and average water temperature is 40 °F (4 °C) in winter and 76 °F (24 °C) in summer. Clear Lake is believed to be one of the oldest lakes in North America. The lake sits on a huge block of stone which slowly tilts in the northern direction at the same rate as the lake fills in with sediment, thus keeping the water at roughly the same depth. Core samples of the lake's sediments, taken by U.S. Geological Survey geologists in 1973 and 1980, indicate that the lake is at least 480,000 years old. Some experts feel that Mono Lake, to the east of the Sierra Nevada in California, is older than Clear Lake. However, the sedimentary history of Clear Lake is unbroken, while Mono Lake's sediments have been disturbed by past eruptions of the Long Valley Caldera and associated volcanoes. 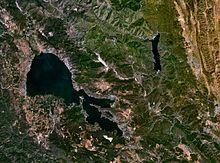 The geology of Clear Lake is chaotic, with numerous small faults being present in the south end of the lake as well as many volcanoes, ranging in age from 10,000 to 2.1 million years, the largest being Mount Konocti, sitting at the middle of the lake's south shore. At one time Clear Lake was even bigger than it is now, and included the Blue Lakes (to the northwest of Clear Lake). Volcanic eruptions and subsequent landslides changed the landscape dramatically, forever separating Clear Lake from the Blue Lakes and from its former westward drainage into the Russian River. Archaeologists believe that the Clear Lake basin has been occupied by Native Americans for at least 11,000 years. (See: Post Pattern.) Evidence of this has been found at nearby Borax Lake and on Rattlesnake Island in the lake's south arm. Abundant fish, game and waterbirds made Clear Lake an oasis in the otherwise harsh conditions of Northern California's mountains. The native Clear Lake Hitch (Lavinia exilicauda), was once so abundant that millions of hitch clogged the lake's feeder streams in dry months. When the Spanish missionaries came to California, they found that thousands of Native Americans lived in the Clear Lake Basin, primarily Pomo, Yuki, and Wappo with some Lake Miwok. European settlers arrived, starting around 1845. Frequently they abused and exploited the native Pomo people. One of the most notorious incidents was the Bloody Island Massacre of spring 1850. A number of Pomo were enslaved and abused by settlers Andrew Kelsey, whose name is attached to the town of Kelseyville today, and Charles Stone. The Pomo finally revolted and killed Kelsey and Stone. A United States Army contingent under Lieutenant Nathaniel Lyon cornered as many as 200 Pomo on an island in Clear Lake, and slaughtered most of them—including scores of women and children. The historical marker for Bloody Island is on Highway 20 between Upper Lake and the Robinson Rancheria. Later, the Pomo were forced to live in small "rancherias" set aside by the federal government. For most of the 20th century, the few remaining Pomo people had to live on these tiny reservations in poverty. Today the fastest-growing businesses around Lake County are the casinos presently operated by four Pomo rancherias, with more casinos planned. Clear Lake was used as an outlying seaplane base for Alameda Naval Air Station during World War II and the early years of the cold war. Flying boats could land on Clear Lake when landing conditions were unsafe on San Francisco Bay. Exhibits and programs about the region's culture and history are maintained and presented by rangers and docents at Clear Lake State Park and at Anderson Marsh State Historic Park. Lake County has two county museums, the Lake County Museum in Lakeport and the Lower Lake Historical Schoolhouse Museum in Lower Lake. There are also numerous state and local historical landmarks identified throughout the county. Within over 100 miles (160 km) of shoreline, Clear Lake is a popular spot for water sports enthusiasts. Fishing, swimming, sailing, wind surfing, waterskiing, boating, and riding personal water craft are all popular activities, primarily in the summer. There are 11 free boat launch ramps around the lake that are open to the public. Individuals may rent boats and personal water craft from many businesses around the lake. Clear Lake is sometimes called the "Bass Capital of the West." Largemouth bass, which are farmed and planted in the lake by California Department of Fish and Wildlife, crappie, catfish, bluegill, and rainbow trout can be found in the county's lakes. Fishing boats can be rented, and many stores and facilities around the lake specialize in fishing equipment. Numerous fishing tournaments and derbies are held through the year. Area wineries with tasting rooms include Guenoc and Langtry Estate Vineyards and Winery, Ployez Winery, Steele Wines, and Wildhurst Vineyards. All boaters entering Lake County are warned that Dreissenid mussels, otherwise known as quagga and zebra mussels are a great threat to Clear Lake. By law, boats are required to be inspected before launching. Shops in the vicinity carry out the inspection. At every entry to Lake County, signs warn boaters not to spread hydrilla in the county's bodies of water. Extensive management efforts have controlled the presence of hydrilla in Clear Lake, although it may return at any time. The lake is also the site of an annual "splash-in", the "oldest and largest seaplane gathering in the Western United States". The California Office of Environmental Health Hazard Assessment released an advisory statement regarding eating fish caught from this lake based on the mercury level. DeWitt Clinton Rumsey, previously a cattle drive "Captain" (and after whom the town of Rumsey in Yolo County was named), was one of the first to record the water levels of Clear Lake. Its level was originally controlled by a rocky ledge in Cache Creek, called the "Grigsby Riffle" (which is now submerged upstream of the 1914 dam). In 1872 Rumsey installed a gauge in Lakeport to record the water level. He defined the level when the lake ceased to flow over the ledge as "Zero feet Rumsey", which corresponds to an elevation of 1,318.26 feet. The reading is called "on the Rumsey Gauge" or "Feet Rumsey", which can fall below zero due to evaporation (over 3 feet a year) and pumping of water. The highest recorded level is 13.66 feet in 1890, and the lowest is -3.50 feet in 1920. In 1991 a court ruled that the official "low water mark" (which determines property ownership) is Zero feet Rumsey. The Rumsey gauge, now automated, is still in operation. The drainage basin is 458 square miles (526 including the lake), which is large compared to the lake's 68 square miles. Seventy percent of the terrain has very shallow top soil, which saturates after a rainfall of 3 to 4 inches, after which runoff flows quickly into the lake. The maximum flow from the lake is determined by the narrow canyon of Cache Creek, not by the dam. The combination of rapid inflow and slow outflow results in frequent flooding of low elevation areas such as downtown Clearlake and Lakeport. Yolo County acquired riparian rights to Cache Creek's water in 1855, and after gaining water storage rights in 1912 they built the Cache Creek dam. Water companies which rely on the lake have to pay Yolo county for their water. The Gopcevic (1920) and Bemmerly (1942) Decrees prohibited the modification of the Grigsby Riffle, set the normal maximum level of 7.56 feet Rumsey, and required Yolo to keep the level below 9 feet except for limited times during floods. Yolo was entitled to use all the water down to zero feet. The Solano Decree (1978,1995) limited the amount of water Yolo could use: if the lake is "full" on May 1—at 7.56 feet Rumsey—then they can draw 150,000 acre-feet, equivalent to a drop in the lake level of about 3.5 feet. If the level on May 1 is below 3.22 feet they can draw none, with a proportional amount for other levels. They must stop on October 31, or if the level falls to one foot. In compensation the Indian Valley Reservoir, also entirely in Lake County, was constructed in 1975, and is under the full control of Yolo county. The northern end of Clear Lake adjacent to Rodman Slough and Middle Creek was blocked off with levees, between 1900 and 1940, and the land was "reclaimed" for agricultural use. A project is currently under way to breach the levees, and restore 1,650 acres of lake and wetland. Bloody Island will again be an island. The additional water resulting from the increased lake area will be allocated to municipal districts drawing water from the lake. Yolo's water allowance under the Solano decree may also be increased. The management of the lake level is thus designed to avoid flooding, to provide water to Yolo county and local water companies, and to maintain enough water for recreational use. Sewage from many Lake County towns no longer flows into the lake; instead, it is pumped to The Geysers geothermal plant. On September 15, 2014, the lake level fell to −0.31 on the Rumsey gauge, the lowest level since the 1977 drought. The Clear Lake basin (i.e., "lakebed") lies entirely within the Upper Cache Creek Watershed and the lake drains to the Sacramento River through Yolo County. During the summer months, Clear Lake provides irrigation flows for agricultural operations in Yolo County. Management of the lakebed is provided by the County of Lake, in accordance with authorities granted by the State Lands Commission in 1973. Various local ordinances protect the lake from land-use practices in the domesticated areas of the surrounding watershed, and the lake's water quality impairments are addressed by federal and state regulatory programs. Multiple water suppliers in communities surrounding the lake provide potable water for municipal uses in accordance with California's public health regulations. Lake County participates in the State Department of Water Resources' Integrated Regional Water Management programs, within the Westside Region including Lake, Colusa, Napa, Solano, and Yolo counties. The Lake County Watershed Protection District is the lead agency for Lake County's participation in the Westside Region's long-term (2013–2033) water management programs. Within the jurisdictional boundary of the County of Lake, the Watershed Protection District provides the "Lake County Clean Water Program" for compliance with the National Pollutant Discharge Elimination System (NPDES) pollution prevention programs, and with the NPDES stormwater management permit (issued by the State Water Resources Control Board as Water Quality Order 2013-0001-DWQ), by implementing the Lake County "Stormwater Management Plan". Lake County also complies with the NPDES aquatic pesticide permit program, allowing licensed pesticide applicators to eradicate nuisance aquatic weeds, in accordance with the "Clear Lake Integrated Aquatic Plant Management Plan". Multi-jurisdictional programs for natural resource management in the Clear Lake watershed—including federal, state, and local land owners in the County of Lake—are described in the "Clear Lake Integrated Watershed Management Plan". The lake is heavily contaminated with mercury from the nearby Sulphur Bank Mercury Mine. The abandoned mine was declared a Superfund site in the early 1990s and is still undergoing clean-up. The California Department of Fish and Wildlife presently recommends that women of child-bearing age and children do not consume certain fish from Clear Lake, due to the presence of methylmercury compounds in lake sediments. The Clear Lake basin attracts large quantities of waterfowl, including mallards, western grebe, coots, various species of geese, ospreys, plovers, mergansers and many others. Wild turkeys, blacktail deer, gray squirrels, ground squirrels, skunks, river otter, raccoon, mink, and muskrat. There have been occasional sightings of mountain lion and ringtail. Opossums, red-tailed hawks, turkey vultures, and other species are also common. The endangered northern spotted owl is seen occasionally. Common reptiles and amphibians include the northwestern pond turtle, California king snake, Pacific gopher snake, garter snakes, northern pacific rattlesnake, common bullfrog and the rare giant salamander among many others. Much of the shoreline is developed, but parks, reserves, miles of open water and private land also exist allowing many opportunities for observing and enjoying nature. The county also hosts a growing population of the rare tule elk, recently reintroduced after being locally hunted to extinction one hundred years before. A large colony of bald eagles is found in the Cache Creek canyon. In addition to the native Clear Lake hitch (called chi by the native Pomo), the lake hosts channel catfish, white catfish, brown bullhead, crappie (both black and white species), and other native fish species, as well as Florida strain largemouth bass and carp placed by the Department of Fish and Wildlife for sporting purposes. Along the shoreline and creeks there are aquatic growths of tule, cattail, willow, cottonwood, box elder, and many other types of riparian plant life. The streams feeding Clear lake contain Sacramento pikeminnow, California roach, and rainbow trout. Lamprey are present in at least one stream, Kelsey Creek. Prior to the construction of a dam on the outlet of Clear Lake, both steelhead and Pacific lamprey ascended Cache creek to spawn in Clear lakes tributaries. The rugged coastal mountains surrounding Clear Lake are covered with thick stands of oak-madrone forest, manzanita, sage shrubs, chaparral, grasses etc. Most common trees include blue oak, valley oak, interior live oak, pacific madrone, California scrub oak, plus very occasional coast redwoods and tanoak. Large stands of western white pine may be seen in the higher elevations. The heavy forestation and ruggedness of this part of California has helped prevent wholesale real estate development or farming. On the northeast slope of Mount Konocti is a heavily forested area known locally as the "Black Forest", because it never gets direct sunshine. This area has some Douglas fir in very heavy stands. Clear Lake is well-known among entomologists for the Clear Lake gnat (Chaoborus astictopus) and historical control efforts. This species of "phantom midge" (so called because the larvae are transparent and very difficult to see) measures less than 1/4" long and resembles a tiny mosquito, but is non-biting. Clear Lake gnat hatches start anytime from March through June, depending on weather. Before pesticide use began in the 1940s (Refer to Rachel Carson's book Silent Spring, chapter 4), the gnat was so abundant around the lake in the summer that large piles of dead gnats appeared beneath streetlights, looking like dirty snow. The gnat swarms were so thick that people driving along the edge of the lake reported stopping every 1/4 mile to clean off the gnats off the windshields and headlights of their cars so they could see, and pedestrians tied kerchiefs over their faces to avoid inhaling the gnats. In 1949, as part of an effort to boost tourism and improve the local economy, DDD (dichlorodiphenyldichloroethane) was applied to the lake in heavy doses to eradicate the gnats that were driving summer tourists away from the lake. The treatment succeeded in controlling the gnats that year and for the following year, however in 1953 the gnat population rebounded, prompting another application in 1954. The final application of DDD to Clear Lake was made in 1957 (Cook 1963). Numbers of western grebe were found dead, their tissues containing high concentrations of DDD. The effects were devastating to the local ecology. From 1962 to 1975 carefully planned applications of methyl parathion were made for Clear Lake gnat control. The gnat still occurs in Clear Lake, but at much lower numbers than in the 1940s-1970s. The Clear Lake gnat's population is believed to be kept in check now by two introduced fish species (the threadfin shad and the inland silverside) that compete with the Clear Lake gnat for its preferred zooplankton for food. It is not uncommon for temperatures in the summer to go into the triple digits or below freezing in the winter. Occasional summer thunderstorms occur but are not common. Snow can fall to lake level but accumulation is rare. Snow on the surrounding mountains is common. The average high temperature is 92 °F (33 °C) in summer, and the average low is 32 °F (0 °C) in winter. Normally July is the hottest month and December the coldest. December and January are the wettest months, with an average of 5.95 and 6.45 inches of rain per month, respectively. ^ "Clear Lake". Geographic Names Information System. United States Geological Survey. ^ "Clear Lake California is the oldest lake in the US". Lake County. Retrieved May 23, 2018. ^ a b c d e f "Clear Lake is Unique". www.co.lake.ca.us. Retrieved July 2, 2016. ^ "Clear Lake ranked as best bass fishing lake in West". Retrieved July 2, 2016. ^ Admin, OEHHA (August 7, 2018). "Clear Lake". OEHHA. Retrieved November 6, 2018. ^ "Clear Lake Massacre or the Bloody Island Massacre". Chris and David. Retrieved March 30, 2013. ^ "California State Military Museum". M.L.Shettle. Retrieved August 2, 2011. ^ "Lake County Invasive Mussel Prevention Program". Lake County California Department of Water Resources. Retrieved December 8, 2013. ^ Larson, Elizabeth (September 28, 2012). "Planes to begin arriving Friday for annual Clear Lake Splash-In". Lake County News. Retrieved February 9, 2014. ^ Admin, OEHHA (December 30, 2014). "Clear Lake". OEHHA. Retrieved June 11, 2018. ^ Knight, Terry (February 2, 2010). "It's called the Rumsey Gauge for a reason". Record Bee. Retrieved February 10, 2014. ^ Wilson, J. M. (1902). Irrigation Investigations on Cache Creek. Congressional Serial Set : US Doc 445. p. 155. ^ a b "Cache Creek DamFlows". article. Lake County. Retrieved February 10, 2014. ^ De Leon, Scott. "Historical Water Levels of Clear Lake" (PDF). Report. County of Lake Water Resources. Retrieved February 21, 2017. ^ Peterson, Judge J. "County of Lake vs Smith, March 8, 1991". Court ruling. Court of Appeals of California, First District, Division Two. Retrieved February 12, 2014. ^ "City of Lakeport Emergency Plans". Report. City of Lakeport. Retrieved February 10, 2014. In the past twenty years, federal disasters due to flooding were declared six times in the City of Lakeport during 1983, 1986, 1995 (twice), 1997, and 1998. ^ "WMP District Water Supply". Article. Yolo County. Retrieved February 10, 2014. ^ Richerson, Pete, Scott. "Anderson Marsh". Book Chapter. University of California. Retrieved February 12, 2014. ^ Bray, Judge J (December 2, 1942). Bemmerly v. County of Lake 55 Cal. App. 2d 829. http://law.justia.com/cases/california/calapp2d/55/829.html: California Appeals Court. ^ "Applications" (PDF). Retrieved September 2, 2018. ^ "Calpine Corporation - The Geysers". Retrieved June 11, 2008. ^ Larsen, Elizabeth (September 16, 2014). "Forecasters predict chance of rain this week; US Drought Monitor puts Lake County in 'exceptional' drought category". Online news report. Lake County News. Retrieved September 16, 2014. ^ Lydersen, Kari (June 12, 2006). "Mercury Warnings a New Part of Tribe's Tradition". The Washington Post. p. 2. Retrieved July 6, 2009. ^ "Government stands by as mercury taints water". The Globe Gazette. September 18, 2009. Retrieved March 30, 2013. ^ "Document Display (PURL) - NSCEP - US EPA". nepis.epa.gov. ^ "Fish Consumption Guidelines for Clear Lake, Cache Creek, and Bear Creek (Lake, Yolo, and Colusa Counties)". Office of Environmental Health Hazard Assessment. May 2014 [20 January 2005]. Retrieved July 6, 2009. ^ "Chi Council for the Clear Lake Hitch". lakelive.info. ^ "Flora & Fauna". CLSPIA. ^ "Inland Fishes of California". ^ Carson, Rachel. Silent Spring. "Clear Lake". Global Volcanism Program. Smithsonian Institution. Retrieved December 20, 2008. This page was last edited on 6 February 2019, at 02:53 (UTC).